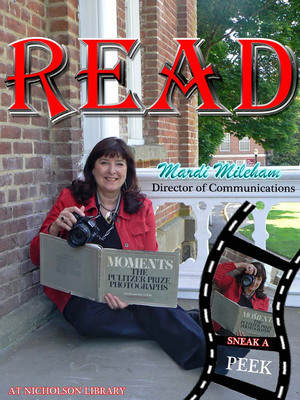 Mardi Mileham, Director of Communications, reading Moments: The Pulitzer Prize Photographs, by Sheryle Leekley and John Leekley. Terry, Paula and Nicholson Library Staff, "Mardi Mileham READ Poster" (2010). READ Poster Gallery. Image. Submission 76.